A T-shirt (or tee shirt, or tee) is a style of unisex fabric shirt, named after the T shape of the body and sleeves. It is normally associated with short sleeves, a round neck line known as a crew neck, with no collar. 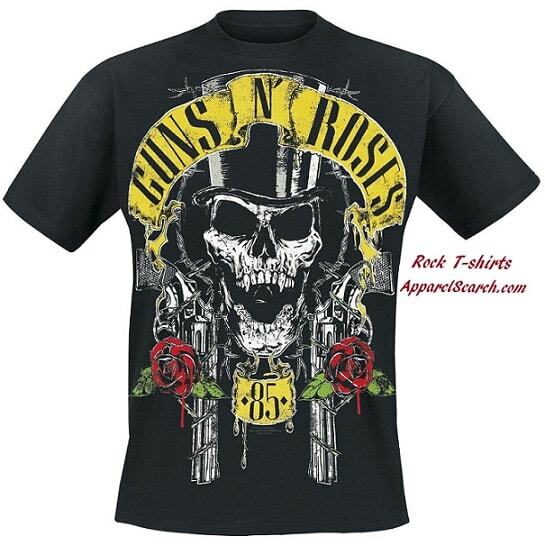 Band shirts are typically t-shirts that have been printed or embroidered with imagery representing a musical band. This would include the bands name, logo, photograph, or relevant illustrations that represent something regarding the band. Find clothing representing your favorite bands. Rock, Punk Metal, Country, R&B, & more. What is the most popular band t-shirt? Well, we are not really sure the answer to that question. However if we were to venture a guess, we would think that the following would be in the top choices. Led Zepplin, Pink Floyd, The Greatful Dead, Rolling Stones, Red Hot Chili Peppers, Iron Maiden, Metallica, Run DMC, Nirvana, Guns N Roses, Ramones, Kiss, AC/DC, Bob Marley, etc. A band shirt can also be a shirt worn by members of a marching band. A marching band is a group in which instrumental musicians perform for entertainment, and prepare for a competition. Instrumentation typically includes brass, woodwinds, and percussion instruments. Most marching bands wear some kind of uniform (often of a military style) that includes the school or organization's name or symbol. Most high school marching bands are accompanied by a colorguard, a group of girls and occasionally guys, who add a visual interpretation to the music through the use of props such as flags. And the band played on. Learn about novelty t-shirts. Rock t-shirts can technically fall under that category of shirt. Music band graphics can also be printed on hoodies. Find information about different t-shirt styles in our fashion terms section. Copyright 1999-2018 Apparel Search Company. All Rights Reserved.